Remember the song that always brings a smile to your face? You know, the one that reminds you of good feelings and good times? Well, you aren’t the only one. Now, Alzheimer’s patients at Capstone Village at the University of Alabama can recall special moments via a new program called Music & Memory Tuscaloosa. Capstone Village is the first Music & Memory-certified retirement facility in the Tuscaloosa area. 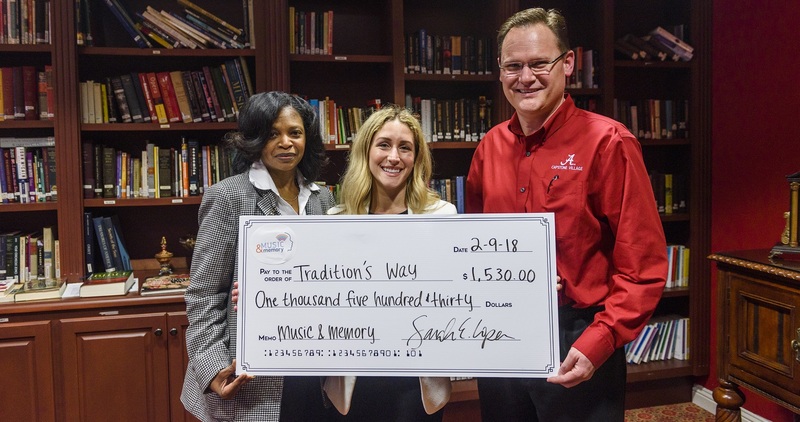 Music & Memory Tuscaloosa, a UA student chapter of the national Music & Memory organization, is a nonprofit organization that brings personalized music into the lives of Alzheimer’s patients in Tuscaloosa to improve the quality of their lives. Tradition’s Way, the Alzheimer’s care unit of Capstone Village, received more than $1,500 in donations to train caregivers and purchase Bluetooth players, headphones, waterproof speakers, chargers and iTunes gift cards. The program aims to create an environment that combats anxiety, depression, sundowning, memory loss and other symptoms associated with dementia and Alzheimer’s. Sixteen Capstone Village residents will participate in the program. Music helps dementia patients recall memories and emotions, and the engaging nature of singing along to music sparks activity in both hemispheres of the brain, according to a 2013 study by researchers at George Mason University. According to Music & Memory’s website, its personalized music program has been field-tested in thousands of care settings throughout the U.S. and around the world. Certified organizations will receive best practices training, peer-to-peer advice and support, and resources such as evaluation tools. Music & Memory Tuscaloosa has 23 active members at the University of Alabama. The group aims to help other Tuscaloosa-area retirement facilities achieve certification. Members accept donations of iPods/MP3 players and iTunes gift cards. The group can be reached at musicandmemorytuscaloosa@gmail.com.